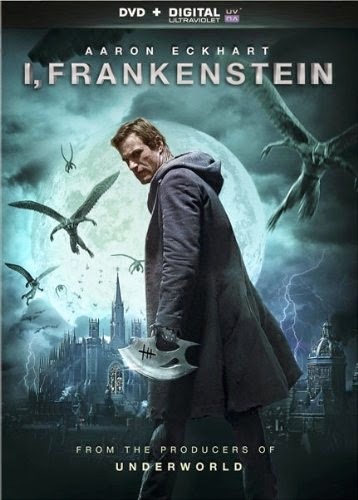 I, Frankenstein is a 2014 Australian-American fantasy action film written and directed by Stuart Beattie and based on the graphic novel by Kevin Grevioux. 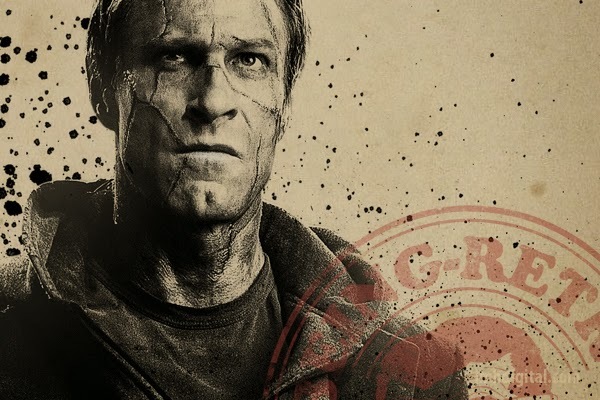 The film stars Aaron Eckhart, Bill Nighy, Yvonne Strahovski, Miranda Otto, Jai Courtney and Kevin Grevioux. In 1795, Dr. Victor Frankenstein (Aden Young) creates a monster (Aaron Eckhart), a soulless creature patched together from corpses, and then rejects it. In a fit of rage, the creature kills Victor's wife Elizabeth (Virginie Le Brun) and Victor chases it to the Arctic to get revenge, but succumbs to the weather. The creature buries his creator and is then attacked by demons before being rescued by the gargoyles Ophir (Mahesh Jadu) and Keziah (Caitlin Stasey), who bring it before the gargoyle queen Lenore (Miranda Otto) and their commander Gideon (Jai Courtney). Lenore explains that they were created by the Archangel Michael to battle demons on Earth and protect humanity. They name the creature "Adam" and invite him to join them, but he declines and departs after being given weapons that allow him to "descend" demons (destroying their bodies and trapping their souls in Hell) as they have the symbol of the Gargoyle Order carved on them. Throughout the centuries, Adam fends off the demons that pursue him. During a modern-day confrontation at a nightclub, a human police officer is killed. While Adam is summoned by the gargoyles once more, the demon Helek (Steve Mouzakis) reports that Adam is alive to his leader, the demon-prince Naberius (Bill Nighy), who is disguised as billionaire businessman Charles Wessex, and his right-hand man, Dekar (Kevin Grevioux). Wessex has employed scientist Terra Wade (Yvonne Strahovski) to conduct experiments with reanimated corpses, and sends a group of demons led by his most formidable warrior, Zuriel (Socratis Otto), to attack the gargoyles' cathedral and capture Adam so he can unlock the secret to giving life. Strong cast of actors, great idea for a film... did they pull it off, I am not too sure that it received the attention they wanted to from a director's view or even the film company. Me personally I liked it for half the film, then it just started looking like everything "Underworld"... and that is a good thing, cause those are the people who made it.